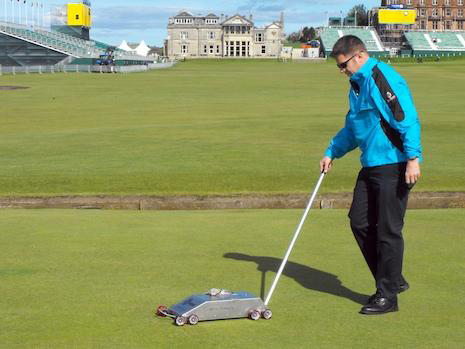 The machine I'm operating in the photo above, on the 1st green of the Old Course, is the STRI Trueness Meter. This measuring device, which I mentioned in a previous post, is designed to measure the amount of vertical and horizontal deviation a ball will experience as it rolls across a putting green. In essence, this device measures how smooth the greens are, whereas the stimpmeter measures how fast greens are. Are green speed and surface smoothness positively correlated? Our measurements this week have shown that factors other than smoothness have an effect on speed, at times, so in some cases the smoothness readings are better when the stimpmeter readings have been lower. I discussed the relationship between surface trueness, or smoothness, and the green speed with Dr. Christian Spring of STRI. He says that there is a positive relationship between the two, but that it is not necessarily a causal relationship. One maintenance technique that improves the smoothness of greens and improves the consistency of smoothness between greens is lightweight rolling. If you haven't been to St. Andrews and the Old Course, you will enjoy the video of the 13th green being rolled this week as the STRI tournament agronomy team approaches to begin collecting performance data on the green. Seeing the roller go across the green gives some indication of the vast size of this putting surface (over 3500 m2). 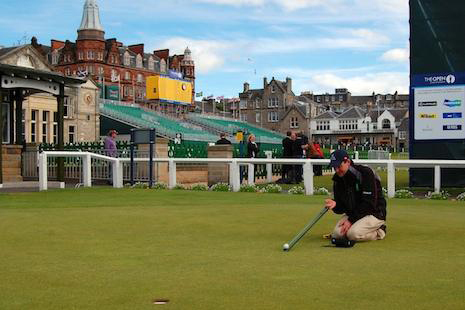 Richard Windows from STRI and championship agronomist for this Open Championship uses a stimpmeter to measure the green speed of the practice green near the 1st tee (see below). We measure the soil moisture, the green speed, the trueness, and the firmness of the greens, and it is quite useful to have these data. I think, and I will write more about this when I have time, that we should be less concerned about what color the grass is, and should simply focus on the playability/performance data. I often hear phrases about golf course maintenance such as "brown is the new green" or "green is soft" or "lean and mean" or "firm and fast" etc.. But that is irrelevant and is mostly visually descriptive. By some simple collection of data about the playability of the course, it is possible to better describe the playing conditions of the course, and that is more relevant to the game of golf.